Admit it, you love waterslides… However clichéd and cheesy a visit to water-park might be on holiday, the sheer exhilaration of plunging down a vertical flume at breakneck speed is something we all secretly look forward to on a sun holiday to our favourite overseas resort. Indeed a world made of gallons of gushing water can provide welcome relief from the searing sun and relative tedium of the beach, as well as being a distraction for the kids! 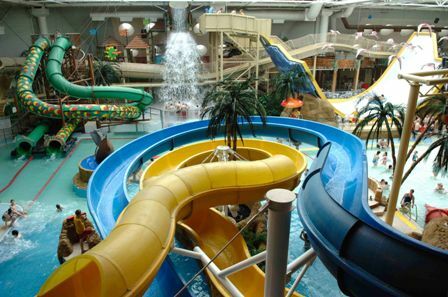 Water parks were first introduced to the world in the late 1940s in the U.S , mostly an evolution of spa resorts, but it may surprise you to learn that the first indoor water-park, now a staple leisure facility in many countries was only built in 1985 in Edmonton, Canada. Water parks are of course defined by their slides which range from the extreme, virtually vertical, end of the scale, to tamer rides like the ubiquitous ‘lazy river’. Noah’s Ark deserves a mention for its sheer size, it is in fact the largest water park in the U.S with 49 different slides and is located in self-proclaimed water park capital of the world, Wisconsin. 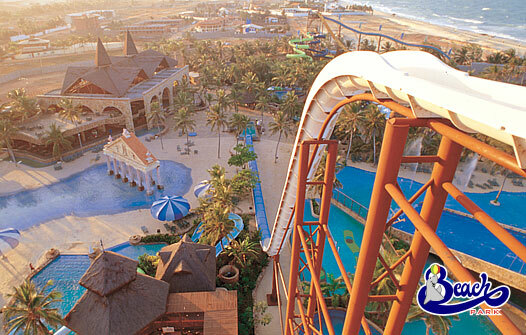 The jewel in the crown however is the ominously – and appropriately- named Scorpion’s Tail, the first waterslides that sends passengers upside down. Well almost upside down, the slide curves round at a 45 angle after riders have been dropped into the ride vertically via a trap-door! If you could rely on anyone to create a cool waterslide, it’s those zany Chinese. 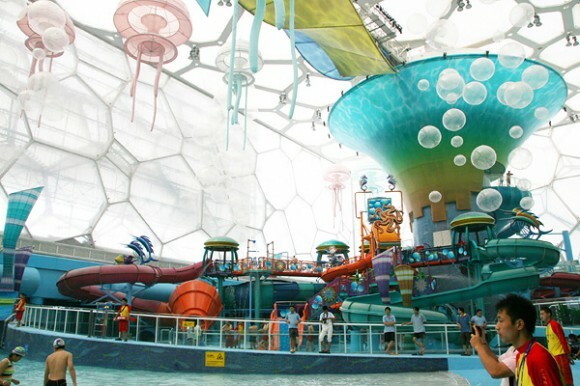 Rather than keeping the dull Olympic pool in the Water Cube building, they decided to convert it into a psychedelically coloured water-park, decked out with slides like the Bullet Bowl; a wide shallow slide which riders are ejected into, spinning round at speed from the centrifugal force generated, before finally exiting from a hole at the bottom. The Master Blaster in Blackpool, England proudly proclaims itself to be the ‘world’s first uphill water slide’. How does it achieve such a feat you may ask, well with the use of clever ‘water injection’ technology which propels rider’s rafts up the incline sections of the slide. Not happy with just one title, Master Blaster is also allegedly the longest indoor slide at 250 meters. This waterslide is unique in that it isn’t actually part of a park, but rather an adjunct to the aforementioned hotel. The slide at the Citta Del Mareis perched on a steep Cliffside and features three distinct level levels, with two slides exiting into mini plunge-pools, before the fourth and final length of the slide exits into the sea below. This oddly named water park franchise with four locations in the U.S (three in Texas and one in Kansas) literally translates as ‘slippery road’ in German, the perfect description for most of its attractions. The standout attraction here however is not so much a slide as a simulated surfing experience. 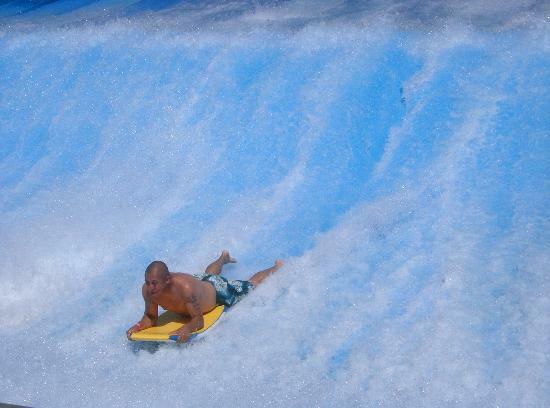 The Boogie Bahn is a wide flat slope continually fed with a flow of water where budding body-boarders and surfers can test out their skills without the danger of eaten by a shark! A pretty standard waterslide form wise, but Insano certainly delivers when it comes to serving up some classic thrills. The stringent safety restrictions are testament to the boundary-pushing magnitude of Insano, a 41 meter-high chute that propels riders down at breakneck speeds of 60mph, ensuring the reach the bottom in a swift 4-5 seconds. Not for the faint-hearted!